Mary Cressler is equally comfortable with tongs in her hand as she is with a glass of rosé. In fact, you might find Mary holding one of each as she monitors slow-cooked BBQ in the yard of her Portland, Oregon home. Not only can you find her writing at her online HQ, Vindulge, but you can also check out Mary's work at Palate Press and Barbecue America. 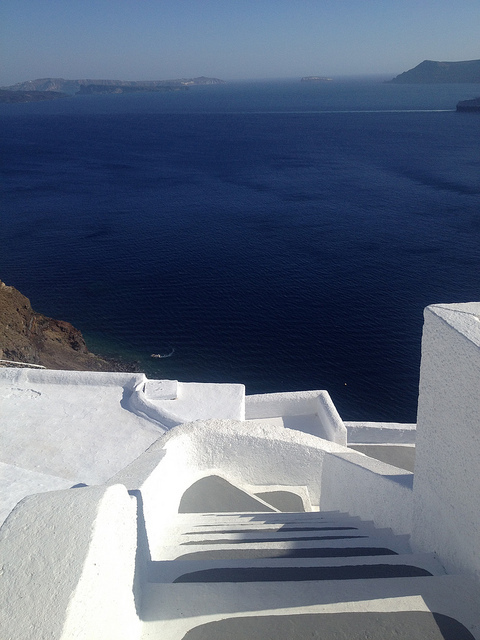 For this edition of SpeakEasy, we talk grilling and sipping, the astonishing whites and blues that color Santorini, plus some practical advice on visiting wineries with children in tow. Not only do you enjoy rosé year-round but you also enjoy firing up the grill and smoker even in the darkest depths of winter. How would you convince someone who confines both activities solely to the warmest, sunniest months of the year to expand their horizons? We barbecue year-round because we love it and it has become a part of our lifestyle, so we’ve adapted it to a year-round experience. We don’t let foul weather get in the way of cooking up our favorite cuisine because, to us, like any cooking technique, the flavor is what we want regardless of weather. With rosé, much like barbecue, I love to drink it all year long, and not only because it’s refreshing and priced right, but because it’s a great food wine. It compliments foods of all seasons and should be embraced year round for that very reason. I mean, look at the typical Thanksgiving dinner! It’s perfect wine for that meal, so why only drink it in summer? You and your husband came from two different worlds...of ribs. How did you put aside your differences and come to a place of compromise without compromising flavor? We just experimented with different styles over the last few years (over and over again) and found what worked for both of us. He started adapting a technique to impart more juiciness to the ribs without them needing to be drowned in sauce, and he also learned to cook them so well that I no longer desired the sauce, and instead appreciated the tenderness and the balanced flavor that the smoke gave to the meat. We also now serve the sauce on the side, for those moments you do just feel like dousing the ribs. Besides rosé, what are some of your favorite wines with smoked meats and why? What’s the challenge in these kinds of pairings? Most people assume barbecue equals big bold flavors, thus usually recommend big bold red wines to match the power, or sweet wines to offset any heat. While those are easy answers, there’s much more to it. In our house we don’t strive for a campfire style smoke, nor do we add much heat, instead we aim for a mild smoke infusion (fruit woods) with balanced flavors. This lends itself to a wider range of wine options. For sweet or acidic sauces I like Barbera (or similar wines), and, for something different, sparkling wines. Sparkling is great with BBQ! For the big bold flavors, like juicy ribs, I like reds from Washington State. As much as I’ve been known to drink rosé with Texas style brisket I also love it with Tempranillo. But one of my favorite things to barbecue is salmon (and I’m not talking lox). It’s amazing how juicy and flavorful it ends up after slowly cooking on a smoker. And I love pairing it with local Pinot Noir (a varietal not usually associated with smoked foods). Shifting gears, we were both on a press trip to Santorini. Besides my astonishing white t-shirt collection, what were some of the most memorable takeaways from the island and its wine, especially Assyrtiko. Santorini was always a bucket list destination for me, and I still pinch myself that I even had the opportunity to travel to such an incredible location in the first place. What you see in the pictures of Santorini is exactly what you get – the unique architecture with buildings painted with intense blues and whites, incredible fresh seafood, stunning ocean views. I still can’t decide what was more impressive, your white t-shirt collection, or the dramatic views overlooking the caldera. Or maybe it’s the Assyrtiko (the islands signature white wine variety)? It was amazing to walk through the vineyards in Santorini and understand how the vines are managed. The vineyards don’t look anything like your typical vineyards, with rows of trellised vines. Instead the vines are formed into basket-like shapes that work to protect the grapes from the harsh wind and intense sun. The grapes grow inside the basket, with leaves on the outside sheltering the grapes. The resulting Assyrtiko grapes end up tasting super fresh and bright with lively acidity making them an excellent match for local foods (like fish, feta, or juicy fresh tomatoes). Whenever I think of the perfect wine to teach someone about acidity in wine, my go-to is now Assyrtiko. You are the mother of twin boys. When you travel as a family to wine country, do you have any tips when it comes to tasting room visits to make sure everyone is having a good time? What do your kids think of vineyards and wineries? Get a babysitter! Well, that’s what works for me right now. My kids are only three years old and are energetic, curious, and like to touch everything, so they’re not at the best age for tasting rooms…yet. When we do bring them to wine country it’s usually with friends, and we usually take turns staying outside with them, and rotating going inside to taste. It was actually easier when they were babies and we could put them in a baby carrier. As far as advice to others, I recommend doing some research in advance to find out which wineries are okay with kids. Then once you are there find things to keep the kids entertained; toys, coloring books, iPads (I won’t judge), etc. There are tasting rooms that welcome kids and even provide space for them to play. I love those places! Another option is to rotate kid friendly activities with wine tasting. Go somewhere like a museum or playground, then a winery, and rotate, so it’s not all about the parents and the kids have something that they can look forward to. Make it about a family experience. As far as what my kids think of vineyards? Again, they are three, so they could care less. When I’ve taken them into vineyards to explore all they want to do is eat the grapes. This is probably because I take them berry picking a lot in the summer and they haven’t yet learned the difference between blueberries and under ripe Pinot Noir. Rookie mistake. Some recommended Willamette Valley wineries to visit? For the first time visitor these would be my recommendations. On your way into town from Portland (via 99w) it would just be silly to not start your day at Argyle for some bubbles, and then continue on your path. Head to Stoller Vineyards for the gorgeous tasting room, great wines, and fantastic views. Anne Amie for lovely white wines and more stellar views. Soter (by appt) for some of the best sparkling wine in Oregon. I recently visited Youngberg Hill outside of McMinnville for the first time and wow, the views! I completely adore the town of Carlton. There are several shops, restaurants, and tasting rooms all within a walking distance of each other, many of them are small or boutique producers, like Ken Wright, Seven of Hearts, K&M, and Kramer Vineyards, just to name a few. Just park your car downtown and make a day of it. But don’t discount the Columbia Gorge Wine Region, located about an hour east of Portland. It takes just as much time to get to the gorge from Portland as it does to get to the Willamette Valley. Besides one of the most “gorge”ous (no pun intended) drives ever along the Columbia River, there are several wineries to visit in and around the town of Hood River, like Phelps Creek for their Pinot Noir and Chardonnay, and downtown check out the Old Vine Zinfandel at The Pines 1852, and then go across the river to the Washington side to check out the Rhone inspired wines at Syncline. There are also quite a few breweries in Hood River as well for all you beer fanatics, not to mention lots to do with the kids. Who inspired you to blog and who continues to do so? I started my blog to document what I was learning about wine. There really wasn’t a person that inspired me to do it back then. But in terms of people who have inspired me in my career, there are many. The first person that comes to mind is Cole Danehower, wine writer, author Essential Wines & Wineries of the Pacific Northwest, and former publisher of Northwest Palate Magazine. Years ago, around the time I started my blog, he would invite me to sit on the tasting panel of Northwest Palate. He also gave me my first wine judging invitation. I learned more from him and his team than I could have ever learned in a book about tasting and analyzing wines from a critical standpoint. With writing I’m inspired by those who can capture my attention through their storytelling, like Kermit Lynch in his Adventures on the Wine Route. I loved reading Lettie Teague back when she wrote for Food & Wine Magazine, and the way she would weave humor and personality to her articles. Evan Dawson also has a beautiful way of telling stories, and I’m in awe of his book Summer in a Glass, about the Finger Lakes Wine Region. t reads like a page turning novel. Few wine books have captivated me the way that book did. I also follow a lot of food bloggers and have been inspired to embrace more photography in order to help tell a story because of them. I also love the writing of Meg Houston Maker, and the friendship and encouragement of so many bloggers I’ve met along this road. They, along with my family and friends, inspire me everyday. Most of all, any time a reader reaches out to me to let me know they bought a wine because of me or tried one of my recipes…well that’s more inspiring than anything.